As of Friday last week, 68 people had been sickened by measles in the state of Minnesota since April 11. To put that in perspective, that’s more than had been sickened by measles in Minnesota from 1997-2016. Because of its significance, the Minnesota measles outbreak has received significant attention across the country. It has also been the source of continued anti-vaccine misinformation–possibly as an effort to downplay their own culpability in its spread. I’d like to go through some of that misinformation to clear things up. The outbreak was caused by vaccine shedding. Nope, nope, and nope. The virus being spread, per the Minnesota Department of Health, is the B3 genotype, one known by the World Health Organization to be circulating. The virus used in the vaccine is an A genotype. The vaccine doesn’t cover the strain circulating in Minnesota. Yes, this myth is a rebuttal used when the anti-vaxxers learn that the vaccine isn’t causing the outbreak. Everyone must be getting sick because the vaccine is useless. Nevermind that over 8,000 people have been exposed, and of the 68 people sickened, 64 were unvaccinated. 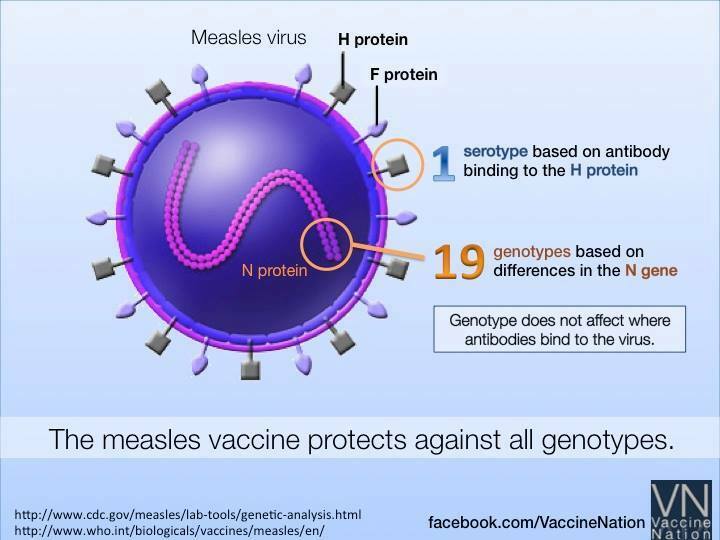 The truth about the vaccine is that while there are multiple genotypes of measles (think of the genotype os the spaghetti-looking stuff inside the measles virus, measles has only one serotype (think of the serotype is the knobby parts on the outside of the virus that). The vaccine is made to train antibodies to latch on to the surface of the virus–the knobby serotype–and to kill it. The vaccine works. It works remarkably well when you consider the over 8,000 Minnesotans who are not sick. Again, untrue. Measles doesn’t care where you were born. And, in fact, the people getting sick from measles are those born in the United States. They are Americans. Measles only cares if you are vulnerable–it is an unvaccinated person problem. Measles is not in Minnesota because of refugees or immigration. You cannot use this outbreak as another feather in your xenophobia hat. Measles is in Minnesota because people were not vaccinated for it–pure and simple. The index case for the outbreak has not been identified, so it could have been someone traveling through the airport or to the Mall of America. It could have been someone coming home from a wild Romanian vacation. But people who travel to the United States to live and work are required to be immunized. I hesitate to speak for any other parent about how they feel about vaccines, so I want to point out this interview with Anab Gulaid, a Somali-American researcher in Minnesota, who says, “Somali parents are not anti-vaccine. They are not the ones out there convincing other parents not to vaccinate.” Furthermore, state data seems to indicate that some Somali parents simply delay the MMR vaccine out of fear, while some get the vaccine on time. Representative Ilhan Omar, an important state and Somali community leader, states in this interview that her children “certainly are” immunized. One of the starkest risk factors for vaccine hesitancy anywhere is in the vacuum of support parents of autistic children find themselves. Parents whose children receive a diagnosis are often left to navigate through the confusing world of special education, therapies, and insurance–not to mention a family life more complicated than they had expected. The anti-vaccine movement had an opening there, and they took it. But they also persisted. During the outbreak, they have held meetings in predominantly Somali-Minnesotan neighborhoods, are currently translating the fraudumentary Vaxxed into Somali, and have attended Minnesota Department of Health community meetings to pass pamphlets out to Somali parents. That’s not all. They are also looking to gain power within Minnesota by writing themselves into legislation. Before the outbreak began, they filed a bill in the Minnesota House that would have given their group, the Vaccine Safety Council of Minnesota, the power to oversee a statewide database of post-vaccine adverse events. (Yes, you read that correctly. They would have had oversight into medical information.) And during the outbreak, they had the chutzpah to file a bill that would have directed the Commissioner of Health to conduct a study of vaccinated versus unvaccinated Somali people. (Note: there aren’t enough unvaccinated Somali-Minnesotans to conduct such a study.) It is as if they won’t stop until everyone is sick. Soon after, the nurse put my daughter back in my arms, and then led us to where we would stay for the next few days. It was an isolation room, a small glass-enclosed space that held a crib, a television and a comfortable chair. Attached to the crib were bars to keep children from climbing out. The room reminded me of a zoo exhibit. The only thing missing was a sign saying, “Beware: human baby with measles.” In that moment, I couldn’t believe how my lack of awareness had led to such a frightening situation. If you think that because your child is vaccinated, you are probably correct. But if your child is unvaccinated, what magical powers do you believe you have to protect your child? Organic food can’t protect against an airborne virus. Being white and wealthy doesn’t mean anything to measles. Homeopathics and herbal supplements are no match for the most contagious virus on earth. You can either keep your child at home and away from everyone during an outbreak (and some are because their children might have been exposed at school or on the bus), or you can vaccinate. For my family, we vaccinated. Oh, and by the way, the vaccine that protects against measles is safe. There were over 8,000 people exposed, almost all of whom were vaccinated. If the vaccine were not effective, there would be thousands of people with measles, not 68. So the fact that the author said it was a different type of measles was not evident to you?